Philippe Coutinho scored his first Liverpool hat-trick to help power them into the last 16 of the Champions League with an emphatic 7-0 win over Spartak Moscow at Anfield on Wednesday night. 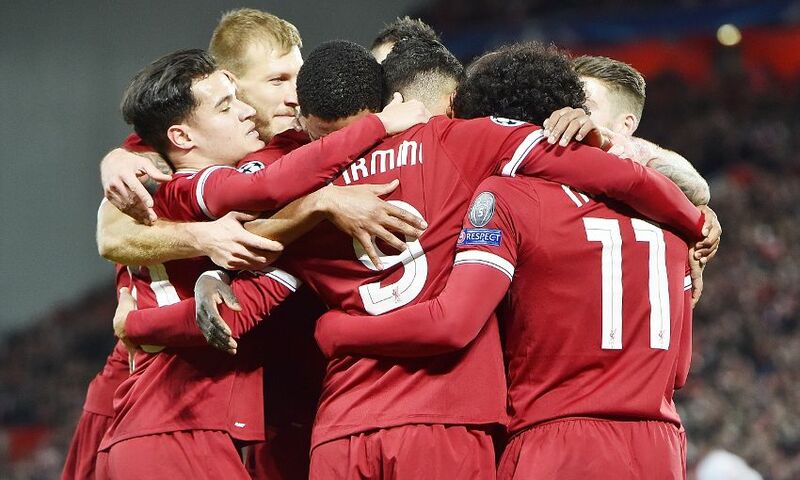 Three goals in the opening 18 minutes stunned the Russian side and confirmed the Reds’ status as winners of Group E.
First, Coutinho, wearing the captain’s armband for the night, scored an early spot kick before sweeping in a second soon after. Roberto Firmino then got in on the act with a first-time finish from close range. Sadio Mane added the fourth moments into the second half with a thumping volley and Coutinho completed his treble by finding the bottom corner via a deflection. Mane bagged a sixth with 15 minutes remaining, turning home substitute Daniel Sturridge’s unselfish cutback from close range, before Mohamed Salah typically added his name to the scoresheet to complete the rout. Liverpool progress into the next stage via first place in the standings and will take their place in Monday’s draw. Jürgen Klopp made five changes to his line-up as Mane returned to a four-man attack that also consisted of Firmino, Salah and captain-for-the-night Coutinho. Elsewhere, Loris Karius, Alberto Moreno, Joe Gomez and Ragnar Klavan also came back into the XI. On a night in which Klopp had called on the power of Anfield to help push his side into the last 16 of the Champions League, Liverpool made the perfect start. Coutinho netted a penalty with just four minutes gone after Salah had been barged in the back by Georgi Dzhikiya when attempting to reach a cross from the Brazilian. The stand-in skipper’s staggered run up deceived Aleksandr Selikhov and he successfully steered into the corner of the net. Mane then lashed a half-volley into the side netting shortly afterwards, while Luiz Adriano had a low swipe palmed away by Karius at the other end. Next, Coutinho attempted to arch an effort into the top corner from a standing position on the edge of the box, only to be denied by Selikhov – but he wasn’t to be thwarted on 15 minutes when he netted his second. A sweeping move forward saw Salah release Firmino into space on the right of the box. It seemed certain the No.9 would shoot, but he elected to play a reverse pass across the box into the path of Coutinho’s run, and he slotted into the bottom corner. Three minutes later and it was 3-0. This time Mane capitalised on Dzhikiya’s poor touch, hurtled towards the corner of the box and attempted to pick out Salah in the centre. The ball struck Salvatore Bocchetti, but Firmino was on hand to ping it into the corner with the outside of his boot. Liverpool were running riot – and their fearsome foursome all combined just after the half-hour to complete carve open their opponents and put Mane clean through, but he struck over the bar from an angle. Soon after, Salah wriggled into shooting position but hoisted it off target under the attentions of two defenders. The only negative from a stunning opening 45 minutes was the sight of Alberto Moreno limping off with an injury in stoppage-time. James Milner was the Spaniard’s replacement. Any suggestions Liverpool would take their foot off the gas in the second period were blown away inside the opening five minutes of the half as they added another two to their tally. First, Mane crashed home a full volley after Milner’s cross to the back post picked out the Senegal forward. Then, Coutinho completed his hat-trick when he bamboozled a series of white jerseys before collecting Milner’s ball back to the edge of the area and finding the bottom corner via the aid of a deflection. Salah could have got in on the scoring act, but his incredible solo dribble inside the box didn’t yield the goal it deserved as Selikhov palmed to safety. However, the visiting goalkeeper couldn’t do anything to prevent Mane adding to the tally after Sturridge came off the bench to unselfishly tee him up inside the six-yard box. And Salah wasn’t to be denied either as he bagged his customary goal at the death to seal the resounding win.